We're a 10 Star Chapter! We are excited to announce that for the first time we have become a Ten Star Chapter. The Ten Star Program honors those chapters who have accomplished many of the key objectives outlined in the AFP Global Strategic Plan including hosting programming on ethics, participating in Chapter IMPACT Campaign and AFP Foundation Philanthropy, hosting National Philanthropy Day Events, participation in the advancement and promotion of philanthropy and charitable fundraising at a political level, improving communication for our members and attending AFP leadership meetings, to name a few. We are working hard to be a strong professional AFP Chapter working for you. You know that feeling when you reach into your pocket and find $20 that you didn’t know you had? Well, did you know that with your AFP membership, you have access to free webinars, our newsletter and to our fundraising magazine: Advancing Philanthropy? Not to mention great networking and learning opportunities right here in your community. Connect with us to learn more about becoming a member! The AFP Foundation for Philanthropy is proud to offer the Chamberlain Scholarship Program for the AFP International Conference on Fundraising. This program is designed to help individuals serving nonprofit organizations develop their knowledge and skills in fundraising. · I am employed as a full-time fundraising professional or spend at least 50% percent of my time fundraising for my employer. · I have never attended an NSFRE/AFP International Conference on Fundraising and understand that only one individual from my local organization can be selected. 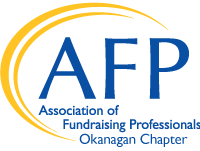 THIS JUST IN: AFP of Okanagan will be offering a $50 off promotion from October 1st through November 30th in honor of National Philanthropy Day. The code will be NPD2018. This discount is good for new members in the professional and associate category only. Print off the coupon code here. Please visit AFP Membership Benefits to read about benefits like this: Did you know members receive a discount to AFP's annual fundraising conference? Members can save up to $400 on conference registration. Early bird registration opens September 19, 2018. You can go to www.afpfc.com for more information! STAY TUNED: For the launch of AFP of Okanagan’s Mentorship Program this fall! Seeking fundraising advice? Wanting to share your years of Fund Development wisdom? This one is for you. Please contact Margo Buckley, CFRE/AFP of Okanagan Membership Chair at mbuckley@ymcaokanagan.ca with any questions about AFP Membership, Benefits or the Mentorship Program. Have you had a chance to tell us what topics you're most interested in learning more about? Please take a few minutes to complete our survey!